Parliament Of Owls: Thirsty kitty! 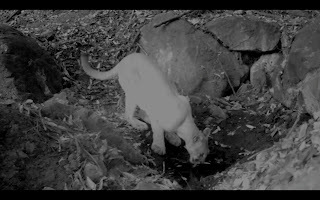 A new female Mountain Lion in a new canyon! Thirsty kitty! A new female Mountain Lion in a new canyon! This is great! So after three weeks, a new female Mountain Lion passes by in the new canyon. I think I notice an injury to her left eye. Something I haven't seen before, leading to me to believe that it's a new lion. About a week ago, right next to my first camera, I unplugged a natural spring, creating a little watering hole. 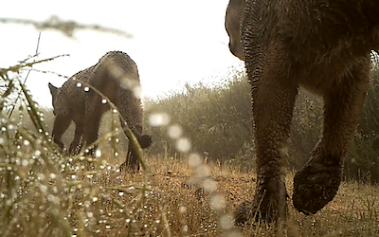 I put a camera up at the watering hole on Friday, and a thirsty lion stopped by on Sunday!